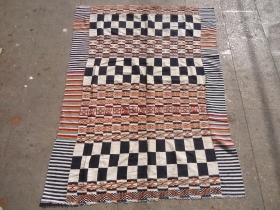 Lets play chess,Arkila old Kilim fragment with very beautiful unusal colors,very fine weave,good condition and age.Size 5'*3'8".E.mail for more info and pics. 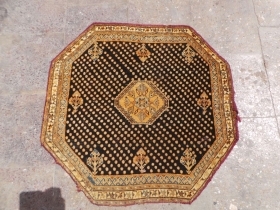 Greek Embroidery three panels with beautiful colors and early age,silk embroidery,nice design.E.mail for more info and pics. 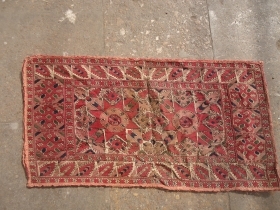 Baluch Bagface Fragment with good age and natural colors,nice design,as found.E.mail for more info and pics. 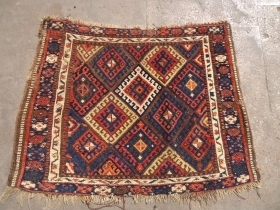 Caucasian embroidery ??? 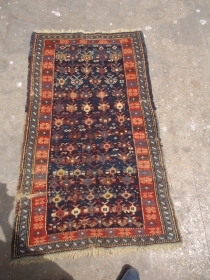 with beautiful colors and good age,as found,with back linen.Size 2'2"*1'2".E.mail for more info and pics. 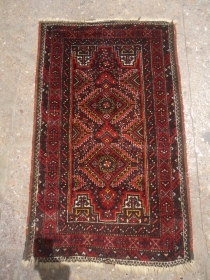 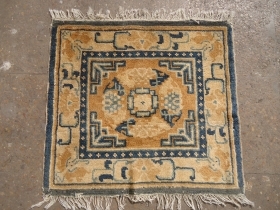 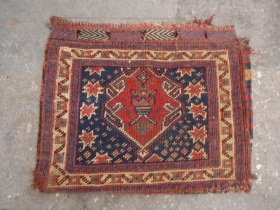 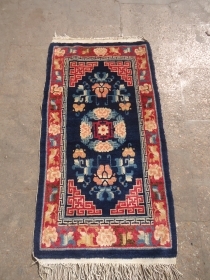 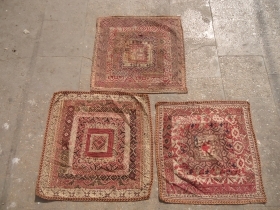 Chinese Mat or Bagface with nice colors and good condition,beautiful design.Size 2ft*1'10".E.mail for more info and pics. 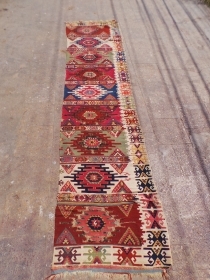 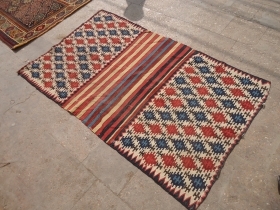 Caucasian Kilim ? 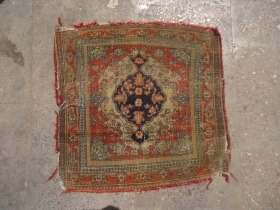 Fragment,all good natural colors,nice design and age.As found without any work done.Size 7'10"*5'11".E.mail for more info and pics. 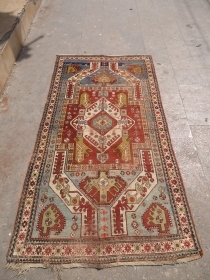 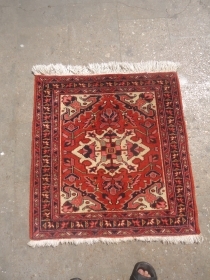 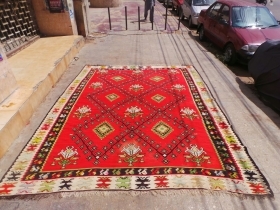 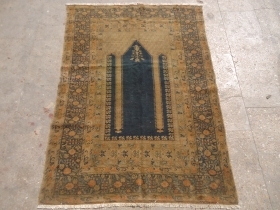 Agra Antqiue rug with noce colors and design,good condition and colors.Size 6'5"*4'1".E.mail for more info and pics. 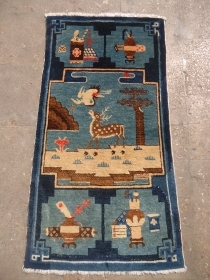 Baluch Rug with very fine weave,natural colors and beautiful design,very good condition,wihout any repair,good age.Size 5'3"*2'10".E.mail for more info and pics. 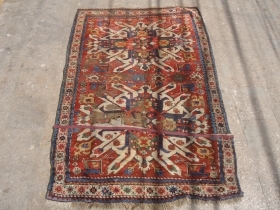 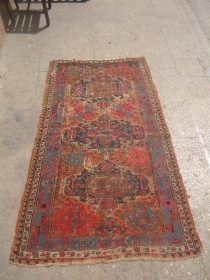 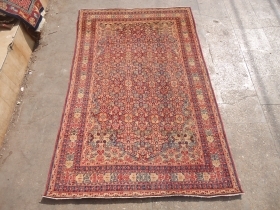 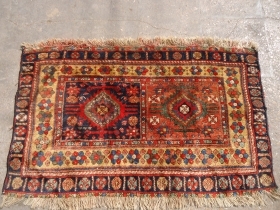 Early Afshar Rug with great natural colors and nice design,as found.Size 4'11"*3'8".E.mail for more info and pics. 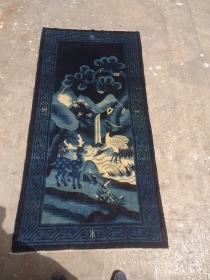 Beautiful Chinese Rug with unusual design,Swan and Deer,very nice colors and excellent condition.Good age.Size 3'10"*2ft.E.mail for more info and pics. 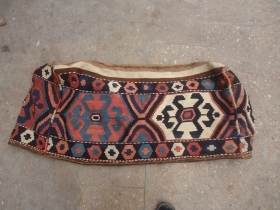 Flatwoven saddle panel.All original,all natrul dyes,wool on wool.Excellent condition.Size Email for more info. 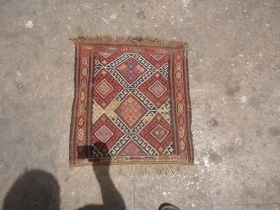 Kasim Ushaq Rug with nice colors and design,good age,as found without any repair or work done.Size 8*4'2".E.mail for more info and pics. 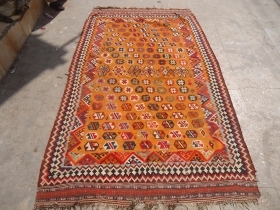 Early Anatolian Kilim fragment with great natural colors and beautiful design.Size 10'9"*2'7".E.mail for more info and pics. 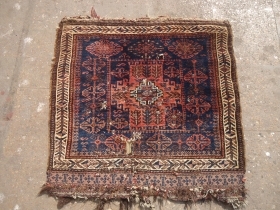 Soumac Mafrash Pannel nice colors and condition,all original wihtout nay repair or work done.E.mail for more info and pics. 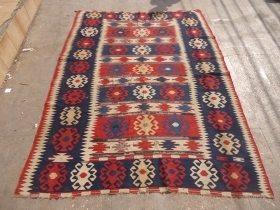 Saroky Pirot Kilim La rage size beautiful colors and excellent condition.Size 10'8"*8'10".E.mail for more info and pics. 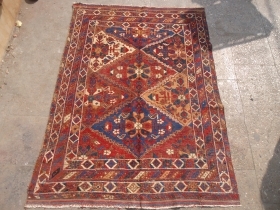 Small Salar Khan Baluch Rug,with great soft shiny wool and all natural colors,very good condition.Size 2'10"*1'8".E.mail for more info and pics. 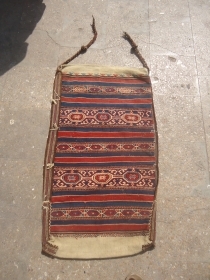 Anatolian Flatwoven Grain bag with nice natural colors and original Kilim backing,good condition age and design.E.mail for more info and pics. 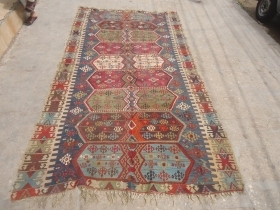 Chelabard Kazak Dated Fragment with great colors and wool,all great natural dyes.Early age.Size 6'8"*4'9".E.mail for more info and pics. 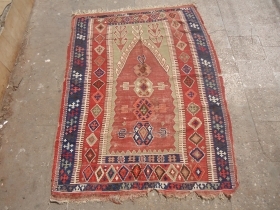 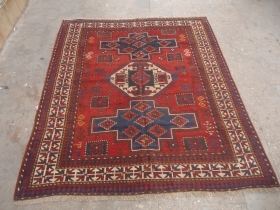 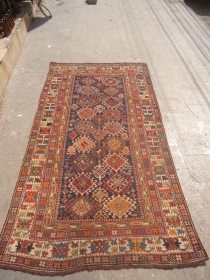 Caucasian Mafrash with great colors and design,all original,good age.Size 3'3"*1'6".E.mail for more info and pics. 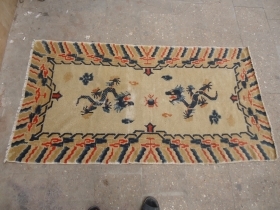 Chinese Dragon Rug with Ivory Groud,without any work or repair done,good age and colors.Size 6'*3'3".E.mail for more info and pics. 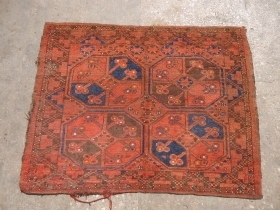 Lori Pambak Kazak with great natural colors and beautiful design,good condition some old repairs done.E.mail for more info and pics. 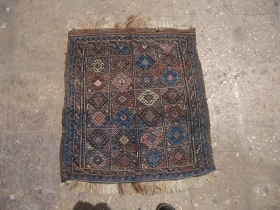 Caucasian Rug with great natural colors and age,as found without any repair or work done,beautiful design.Size 4'10"*2'10".E.mail for more info and pics. 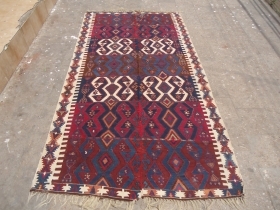 Reverse Soumac Panel with great natural colors and good age,All original,Size 1'10"*1'9".E.mail for more info and pics. 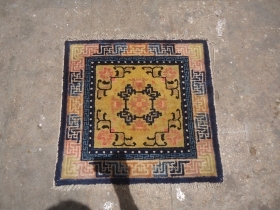 Chinese or Tibet Mat,nice colors,condition and age.Size 2'*1'11.E.mail for more info and pics. 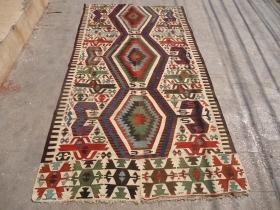 Anatolian Kilim with great natural colors and beautiful design,good age and condition.Size 9'7"*5'2".E.mail for more info and pics. 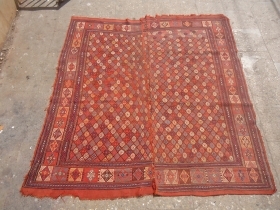 Farahan Pushti early age and natural colors,very fine weave.E.mail for more info and pics. 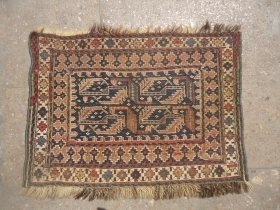 Caucasian Soumac Pannel all natural colors and very fine weave,all original,some oxidation to brown,white is cotton.Size 2'3"*1'7".E.mail for more info and pics. 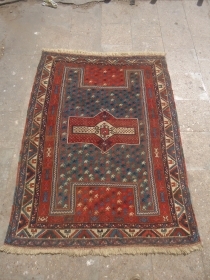 Heriz Mat nice square size with good colors and condition.Size 2'9"*2'10".E.mail for more info and pics. 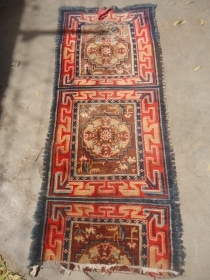 Tibet Seating runner,all good colros and very nice design,early age and beautiful design.E.mail for more info and pics. 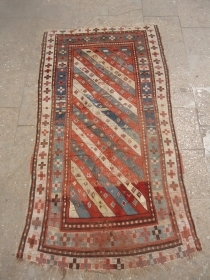 Shirvan Rug with great natural colors and design,very fine weave,old repairs have done,very nice design.Size 5'2"*3'11".E.mail for more info and pics. 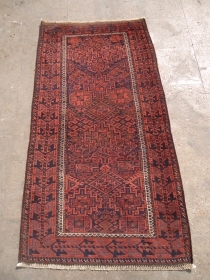 Large Dated Shirvan Rug,very nice design,good age and condition.Beautiful Rug.E.mail for more info and pics. 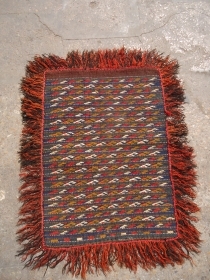 Early Obruk Kilim,all natural colors,very nice design,As found without any repair or work done.E.mail for more info and pics. 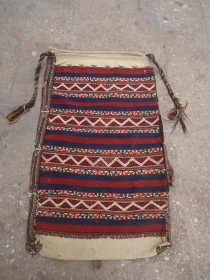 Beautiful Anatolian Grain Bag with original kilim backing,very nice design and fine weave,all orignal.E.mail for more info and pics.